Us Brits like to spend big at Christmas time. An ING study of nearly 12,000 people found the average Briton plans to spend £350 on festive gifts this year – that’s higher than any other country in Europe. However, there’s evidence that today’s savvy generation doesn’t respond well to blatant advertising slogans. The audience at the latest Content Conversation from Outbrain learned that according to National Geographic magazine the average person has a one in 3,000 chance of being struck by lightning. In contrast, Advertising Age says there’s a one in 3,333 chance they’ll click on a banner ad. With this in mind, it is crucial that retailers think outside the box and find new and inventive ways of attracting shoppers through their doors during December, so they can benefit from a slice of the Christmas spending pie. This is why content marketing is so pivotal during the festive season. Beneath the surface of that tear-jerking John Lewis advert featuring Monty the Penguin runs a marketing machine that’s the epitome of how good content can be exploited through multiple channels. Before the advert was even shown on television during Channel 4’s Gogglebox programme, it had already premiered on John Lewis’ social media channels. As of December 16 2014, the YouTube video had clocked up more than 20.6 million views. 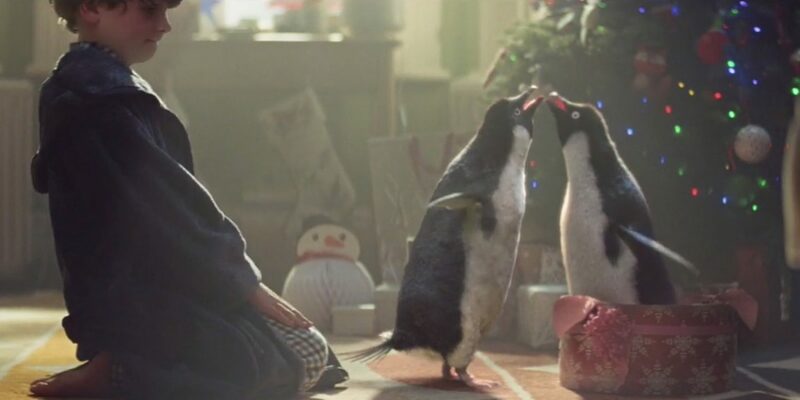 The social media buzz surrounding this small penguin was fuelled by a series of hashtags – the top three Twitter trends in the UK during the ad’s first 24 hours online were #MontyThePenguin, #JohnLewisChristmasAdverts and #FutureJohnLewisChristmasAds. However, social ‘shares’ are a more accurate way of measuring how viral a video is. Shares matter more than views because as David Waterhouse at Unruly recently told The Telegraph, they are a sign of emotional engagement. According to Unruly, the story of Monty the Penguin was shared 202,953 times in its first 24 hours online, whereas the 2013 John Lewis Advert, The Bear and the Hare, was shared 200,000 times. The retailer knows that in order to connect emotionally with viewers and encourage social media shares, it must allow the characters and the storyline to shine, rather than products and slogans. The marketing and PR powerhouse didn’t stop at social media though. Within just a few hours of the advert being shown, news reports were filtering through that Monty the Penguin cuddly toys had completely sold out at John Lewis. What else fuels a consumer’s need and want for a product more than concern about not being able to get hold of it? John Lewis has mastered the art of content marketing on its website and in store too. Monty’s Den can be found in stores around the country and feature ‘Monty’s Magical Toy Machine’, which enables children to bring their favourite toys to life using Microsoft technology. There’s also ‘Monty’s Goggles’, which use Google Cardboard to allow children to enter a 360 degree virtual world where they can interact with Monty and Sam. A whole section of John Lewis’ website is dedicated to Monty the Penguin. Not only does this feature the YouTube video and Monty’s own Twitter feed, kids are also invited to explore the penguin’s so-called ‘Panoramic World’, on their computer, tablet or mobile. The success of Monty the Penguin is such that other brands have even piggybacked on it. McVitie’s has unashamedly tapped into the hype surrounding it to promote its penguin bars using the tagline, “this penguin is for lunch, not just for Christmas”. Along this same theme, it’s perhaps not a surprise that because of the general buzz surrounding penguins this Christmas, eBay has reported a 300 per cent increase in penguin toy sales since the release of the advert.